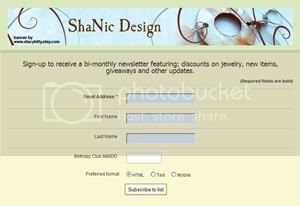 ShaNic Design-Handmade Jewelry: Wow I finally did it. Wow I finally did it. This is my first time posting on my jewelry blog. I have been so busy with school, that I haven't had an opportunity to promote like I should. From what I hear having a blog is a good way to promote and a good way to allow customers to know more about you. Well to start, I am a seller on Etsy, I have been there for about two weeks. I have had one sell so far (yay me). Selling online is a new experience for me. So, I am a little nervous. I love creating different piece of jewelry, using different materials. I try not to do the same thing in my designs but, when it comes to earth tones, you will see that a lot in my pieces. Through out this blog, you will get to know me more. I will post some things regarding Etsy, as well as some advice for potential sellers. I am learning new things myself everyday and I would only hope to pass my knowledge to those who need it. Congrats! I will check back regularly! I will add you to my links. I love earth tone colors in jewelry too. You're a very talented jewelry designer.